This recipe will warm you from the inside out. It will also fill your belly! It’s packed with vegan protein at 16 grams per serving. Each bowl will also give you over 17 grams of fiber. You’ll feel satisfied and energized with each and every bite. This recipe makes 2 main-dish servings. In a large saucepan over medium heat, add 1 tbsp oil. Then, toss in the onion and garlic and saute for 5-7 minutes. Add in the red lentils, spices (cumin, curry powder, turmeric, salt), and 2 cup of water. Bring the mixture to a boil, and then drop to a low simmer and cover for ~25-30 minutes. Meanwhile in a separate pan, add 1 tbsp oil to medium heat. Then, toss in the cauliflower, ginger, lemon juice, sugar, tomato paste, and cayenne pepper. Add 1/2 cup of water. Mix all the ingredients together and allow them to cook for about 10-12 minutes. 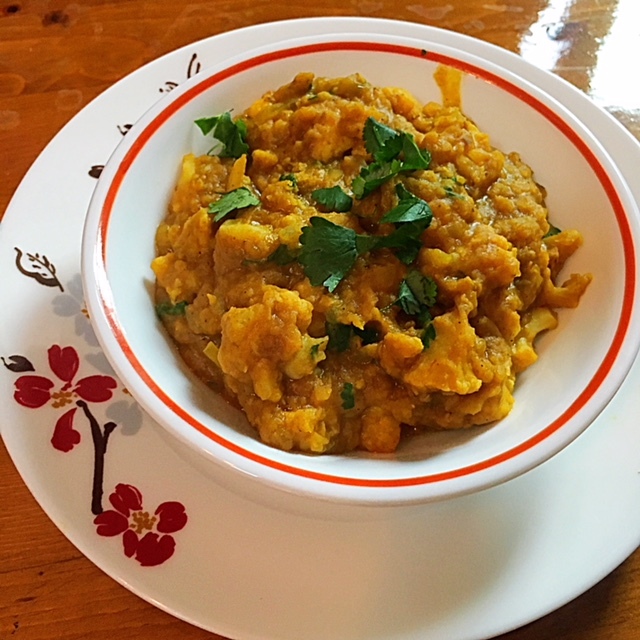 Combine the cooked cauliflower to the cooked red lentils. Mix until well combined. Then, turn off the heat and mix in the chopped cilantro. Serve warm.